This travelling exhibition from the Kelowna Art Gallery presents paintings which survey David Alexander’s international career of over 30 years. His lively renderings convey an immersion into the Canadian landscape. Alexander received his BFA from Notre Dame University in Nelson in 1979, and later completed his MFA at the University of Saskatchewan. His art is in many public, private and corporate collections throughout the world, including the Vancouver Art Gallery, Museum of London, University of Toronto and Concordia University in Montreal, Museum of Art in Iceland, and Canadian Embassies in Berlin, Beijing and Krakow. 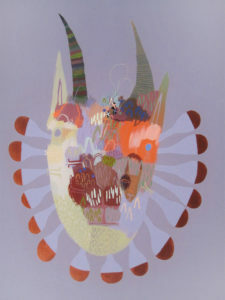 Meghan Hildebrand’s colourful semi-abstract works explore storytelling and re-imagined landscapes. Her ambiguous narratives and playful dream-like imagery draws the viewer in, inviting them to create their own story. In Restless Fables, Hildebrand investigates the relationship between nature, culture and identity through the motifs of masks, animals, maps and globes. Hildebrand has maintained a very active art practice over the last 13 years, exhibiting her work in private and public galleries throughout Canada. She is a graduate of Kootenay School of the Arts, and also attended the Nova Scotia College of Art and Design. She is now based in Powell River, BC. Nelson artist and writer Susan Andrews Grace explores the sacredness of life on earth in her new body of work featuring textile-based printmaking, collage, sculpture and installation. She contemplates the “language of the earth’s beauty” through forms that echo the paths of insects etched in wood and the amorphous shapes in clouds. Reflecting on her Catholic upbringing, Grace refers to religious iconography, but infuses it with her own imagery, drawn from earth-based notions of the sacred. Lynn Dragone will open the exhibition with an unfolding movement ritual, presented through the calligraphic art form of ‘Big Brush’, which expresses birth, life and death, in one stroke. 7pm sharp at the opening reception, Friday Sept.20. Lynn will also offer a Moving with the Big Brush: Calligraphy and Movement Workshop, details to be announced. 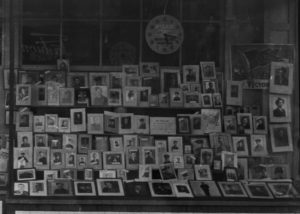 Wood Vallance Window showing photographs of Nelson boys in World War II Victory Bond Appeal. Did you know that the Boeing Aircraft Company operated a temporary production plant in the Civic Center during WW2, and that Boeing required the workforce of about 150 workers to be 65% female? Nelson At War will offer a glimpse into this and other aspects of Nelson’s involvement in World Wars 1 and 2, as well as the Boer War. The exhibit will feature historic photos and news clippings from the Touchstones Nelson Archives, as well as artifacts from the Permanent Collection, such as a scale model of the SS Formidable, the aircraft carrier from which Hampton Gray flew his final ill-fated mission in the dying hours of WW2. 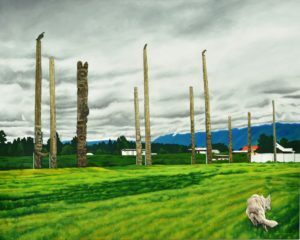 Over the course of a year, Glenn Clark (Penticton) and Peter Corbett (Winlaw), traveled across northern BC, painting the landscapes which would be impacted by the proposed Northern Gateway Pipeline. A selection of their plein air sketches and studio paintings will be shown alongside pertinent information about the region and the scope of the pipeline project. Stay tuned for events which will occur in conjunction with the exhibition, including a panel discussion. Lieut. Hans Lehrke of the Nelson Fire Department lived in the Strathcona Hotel. 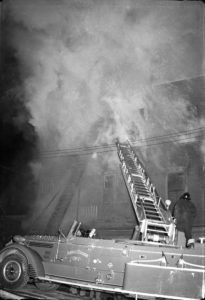 He moved out in January, but four months later, on May 27, 1955, he was a volunteer firefighter battling to save lives as one of the most prominent hotels in Nelson burned to the ground. This exhibit will tell the story of this fire and many others that have changed lives and transformed our community over the decades. It will also celebrate the 100th anniversary of the fire hall on Ward St. in Nelson, and look at changes in firefighting methods and equipment. 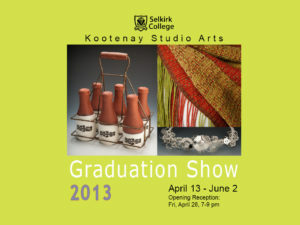 This exhibit features the work of graduating students from the Kootenay Studio Arts at Selkirk College. 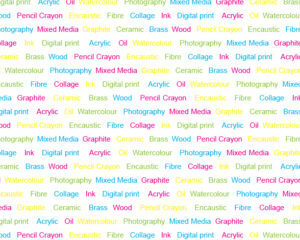 Student work from each of the four studios: Clay, Fibre, Jewellery & Small Object Design and Metal will be displayed. KSA’s programs place emphasis on the skills necessary to become a successful and professional arts practitioner. Hands-on studio work combined with the study of design, drawing, history, and professional practices leads to an in-depth understanding and refined ability to apply the essential elements for success in the industry. I Love You, In Theory will feature a collection of works spanning Winlaw studio-based artist Graham Gillmore‘s career of over 30 years. 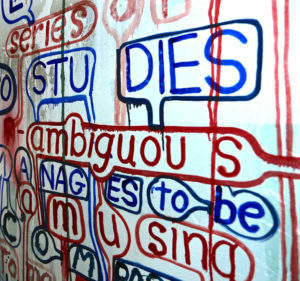 Included are his iconic text-based paintings on panel, canvas and paper, alongside sculptures, and several new works. Gillmore’s text-based paintings appear at once elegant and gritty, carefully executed and spontaneous. From seductive poured paint surfaces akin to the Abstract Expressionist Morris Louis, to dense stacks of roughly drawn, encircled letters, reminiscent of Jean-Michelle Basquiat, his work has wide aesthetic appeal. The highly controlled router-carved block letters of his panel works contrast with the loose line quality of his paintings on canvas, described by artist William Rand “as if painted by the trunk of a baby elephant learning how to spell“. 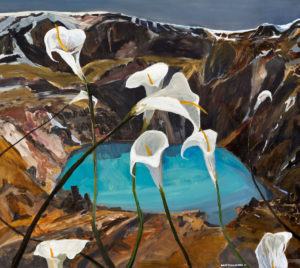 The fragmented messages relayed in Gillmore’s paintings often contain a circular logic and searing irony, using humour and quick-fire wit to counter an undercurrent of loss, cynicism and discontent. His masterful manipulation of clichés, idioms and pop culture references moves the work from personal narrative to a more collective context. 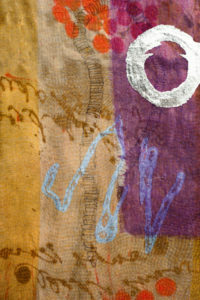 Originally from Vancouver, Gillmore moved to New York City in 1986. For the past 10 years he has divided his time between New York and his studio in Winlaw, BC. Throughout his highly successful career, Gillmore’s work has been shown primarily in private galleries. This will be his first exhibition in a public gallery in BC, and his first exhibition in the Kootenays. This exhibition will showcase the wide-ranging talent of the Gallery’s members. A juried exhibition, it is intended to be as inclusive as possible in order to encourage and support the Gallery’s members who make art. Much of the work will also be for sale, offering a great opportunity for current or aspiring art collectors.